Veronica del Rocio Garcia is the co-host and a producer of Presencia. She is an independent media producer, and she has worked in radio and television for such important networks as Univision. Veronica was an actress in soap operas in her native country Ecuador. 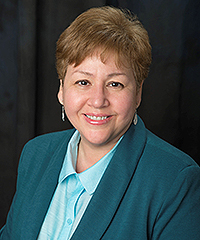 When she arrived in the United States, she became the host of a television show Mujer a Mujer in New Haven, CT.
Veronica has been a community leader for many years. She has also done international journalistic work in such countries as Venezuela and Ecuador. She lives a versatile life, being a mother of two boys as well as a business woman. Zydalis Bauer is the co-host of Presencia. She is a graduate from Westfield State University with a Bachelor’s Degree in Communications (Class of 2011). She lives in Holyoke, Mass. 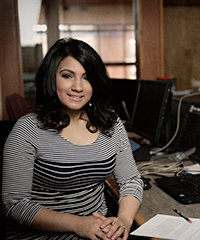 and is an alumni of WGBY’s Latino Youth Media Institute. She currently works part-time at WGBY on various community media projects. Zydalis has worked on a number of local WGBY public television productions, including a special Connecting Point series about the Gerena School in Springfield. For this series, which was called “Divided We Stand,” Zydalis did some on-air work and also produced a segment. Zydalis also worked on WGBY’s Together in Song, assisting with the studio interviews and co-hosting the live finale. Zydalis has been trained to facilitate digital storytelling workshops, and has assisted in behind-the-scenes camera and production work for pledge productions as well as WGBY’s As Schools Match Wits high school quiz show. 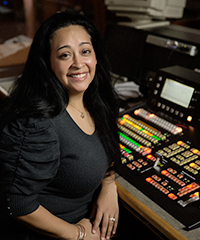 Vanessa Pabón-Hernandez is the producer of Presencia. She is also WGBY’s Director of Community Engagement and Education, overseeing the Latino Youth Media Institute, TOLD, and WGBY’s Latino Advisory Board. Vanessa is a life-long resident of Springfield, having grown up in the North End. She is co-founder of WGBY’s community-based digital storytelling project, TOLD (Telling Our Legacies Digitally), which launched in Springfield’s North End in 2004. She has led digital storytelling workshops and has trained digital storytelling leaders across the United States. Vanessa graduated from Springfield Technical Community College with two associates degrees: Web Design and Graphic Arts. In 2009, the Massachusetts Commission on the Status of Women honored her as an “Unsung Heroine.” In 2011, she was recognized by the Massachusetts House of Representatives for her service and dedication to the Springfield community as an organizer and activist. In 2013, BusinessWest named her to its “40 Under 40” list. In her spare time, you can find Vanessa dancing Salsa. A lifelong resident of Springfield, Mass., Roman graduated from the University of Massachusetts at Amherst with a bachelor’s degree in English. She is an avid reader, television fanatic, and ice cream eater. Awilda Cardona is an avid viewer of WGBY and firm believer in community service. As a contributor to the Presencia blog, she is proud to help serve underserved populations and the interests of the Latino community. 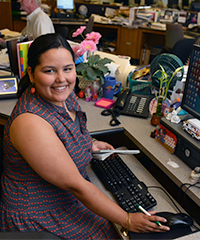 In her full-time work, Awilda is the outreach and events coordinator for Western New England University School of Law. In this role, she facilitates the law school’s connections with outside organizations.